One "Basketball Wives" star is now officially a wife in real life. Evelyn Lozada and football star Chad Ochocinco, whose romance has been chronicled on the VH1 reality show, tied the knot on July 4. If you follow Ochocinco on Twitter, you got a tweeted play-by-play of the festivities on Wednesday, as he quipped, "I'm breathing like a pregnant lady in lamaze class right now... I was hoping continuing to tweet with y'all support would calm me down." Thankfully he seemed to make it through the ceremony just fine, as he was calm enough to later joke about his new bride's four outfit changes. "I got my wife now it's time to get my game back," he posted before asking his 3.5 million Twitter followers, "Is this normal to have more than 1 outfit besides the wedding gown?" Lozada, by contrast, was quiet on her own highly followed Twitter account, but she's told Us Weekly that she's excited to make a home with Ochocinco. "Before we met, we communicated over the phone for a month," she said, adding that's how they got to know one another. "We have a true friendship ... I'm very verbal, and say what I think and feel. He's the same way. He makes me laugh." 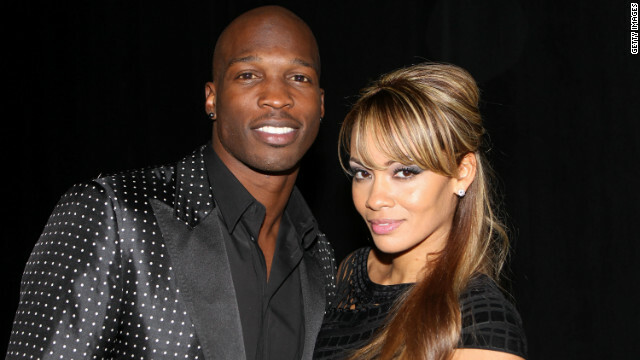 Lozada and Ochocinco got engaged in November 2010, and will show their journey to newlywed bliss on a spinoff reality show, "Ev and Ocho," which is expected to arrive on VH1 in September. « Previous entryMini baby boom: Guess which star couples are expecting? I like the valuable info you supply to your articles. I will bookmark your weblog and take a look at once more here frequently. I'm rather certain I will be told many new stuff right here! Best of luck for the following! congrats you two on your long awaited nuptials. real love conquers all and you two passed god bless the your union!!!!!!!!!!!!!!!!! Happy Married Life. Put God first and all will be well. She is beautiful. I wish them luck. IS IT ACTUALLY NEWS WORTHY?!?!?!?!?! She was never married to a B-ball star... She was Antoine Walker former player with the Boston Celtic's "knock off" chick for 8 years NEVER MARRIED!!!! Evelyn was married to former Boston Celtic/Miami Heat/Kentucky player Antoine Walker. Sorry Sivad, she and Antoine Walker were never married....She was a B-ball girl who been around but never married to a ball player..
On second thought, don't go the website. Your time would be better spent checking out p0rn sites or playing internet poker instead of this whacked out cult. By the way, how is she a "basketball wives" star yet is marrying a FOOTBALL star? Please tell us who she may have been married to before... if he was actually a basketball star. now we can have "football hoo ers" on E! Wow, another reality show spinoff. Who could have imagined they would do that! Lol.. I guess we should just get used to it. This must be the wave of the future. Just another show that I won't watch.